ToolNut mail includes info about several new products from Kreg. This is their parallel guide offering. Documentation is poor but it looks like TSO has nothing to worry about. Apparently they came up with new products/accessories to compliment their new Track Saw/MFT Table setup. You can see a photo of it on Toolnuts website .. Also saw it on Instagram last night ... price for the package is about $899. I like their approach . . . It's the Kreg ACS1000 if you google it more pics come up. I didn't know Kreg was getting into the game I'm a bit surprised they did the whole deal with plunge saw and all. I can see this finding a home in a lot of hobbyists garages. Bet it's finicky to use. I see they put what looks like a vertical hinge at both ends like the front hinge on the MFT/3. Makes sense for raising and lowering the guide rail onto material if you're using dogs for alignment. Interesting thing to note on the plunge saw... it appears to be the first blade left plunge saw I'm aware of. Rest of the system looks fairly intriguing as well. Almost like a manual inverted beam saw. Note: Person shown in the photo is not included. You must provide your own person. Darn ... If it came with a helper in the shop it might be worth considering! I'll pass ... They now have the full product listed with video. It’s larger, includes wheels and handles, includes stabilizers, built in parallel guides with extensions, large size protractor, easily increase the table size. . .
There’s a lot to like in this tool ( table ). It does use an imperial measurement scale though . . .
Now that the video is up we get a look at the hinge. That is a cool design. It looks like you set it to the material height then it sort of pivots up and back an inch and stays there when you need to take out or put a new board in. I recently mounted my GRS-16PE to the rear hinge to try it out and one of my concerns is that the hinge flips up and back. This introduces to me a couple issues. Since the fence (GRS-16PE) is rotating back you have to lower it almost until the rail is touching the material to push the material against the fence. Throw in a parallel guide that you also have to register against and it's a little awkward. Now if you had a hinge design like the Kreg on the table I could see it pivoting up and back a hair to let the material register and slide freely before bringing the rail down. I like it! They clearly studied the existing solution(s) and thought about what's wrong with them and improved upon many of the niggles. Without using it, I think it's a pretty good effort. 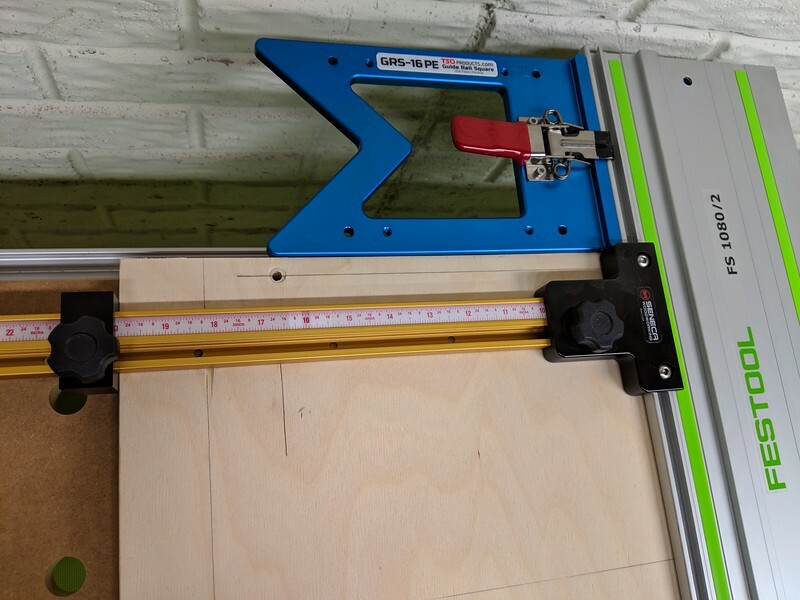 The price is a little steep for the average DIYer, but the capabilities could convince a number of them that a table saw isn't needed and this folds away quite neatly when not in use. It's good in terms of bringing the price of a tracksaw down to a reasonable number for casual users. For almost everyone in that category this is infinitely safer than a cheap tablesaw or a non-track circular saw. This is great! Several significant improvements over previous offerings. They surely did their homework. I only hope the construction quality is as great as the concept. ... and the multiple "cuts" with a non moving blade? It's a new Stationary BladeTM cutting technology from Kreg. EZSmart from EurekaZone have been using double hinge for 10-15 years, but their hinges allow the track to drop all the way down (i.e. there no rigid support at the ends). I did notice all of the dust that wasn't being captured. I wonder if the dust extraction would be better with a vacuum attached. All of the clips with actual cutting only use the dust bag. I'm a little concerned with how most of the Kreg products are made out of plastic. Doesn't seem like it's that rigid or durable. Their In-Line Clamp looks like a toy to me. The only issue with the mft style table is they expect you to cut in the same spot. According to the Kreg rep on FB. Seems like it wastes most of the table top. I do like they sell the table frame/legs separately. Leave it to Kreg... 8 billion 20mm dogs/accessories out there and they go with 3/4". Like you I cannot understand why they did not go with 20mm holes. They probably would have picked up sales from the rest of the world that uses 20mm tables. It looks good for the cost, but I am super iffy on the tapes maintaining their positions and I would have liked to see a little bit more metal, but it is what it is and I am sure lots of great projects will be made with it. If keeps occasional users from buying cheap table saws then the product will be a success. It's actually pretty well thought out. Sure some people demand higher precision than what this provides but that's not their target market. This is leaps and bounds better than all the folks using either the Kreg rip guide or other solutions for guided circular saw cuts. The biggest head scratcher to me is the left side blade saw. Why would they not want to sell the table to all the existing track saw owners. I’m sure someone has already thought about making a 20/96mm hole MFT/3 top for this. I don't see a problem. It's the same track and will work with other track saws just fine, just cut in the opposite direction. re: the 19mm (3/4" ) holes, their existing project center uses 3/4" dog holes, so compatibility there was probably a concern for them. But the table had me thinking of what the practicality would be of reaming the holes to 20mm. A quick google search shows prices of 50-80 USD for the tool, so not much benefit vs just buying an MFT. I don't currently own an MFT, but I do have a DeWalt work table which uses 20mm dog holes, so I am partially invested in the 20mm standard already. Just got the email from ToolNut on this. Thats quite a lot of product they just released. Looks like their gunnin for more than just a parallel guide system. They're after the whole track saw and MFT solution. Yeah, I know. Veritas got themselves caught straddling the .75"/20mm divide and their dog/jig offerings have always been something of a jumble. Just sayin' sometimes you gotta to admit you goofed and make the painful correction. For the record I still think in Imperial but have forced myself to work in Metric, give me headaches sometimes. I am super stoked for this from Kreg, and I'll be buying the track saw for sure. I am a fangirl and I love everything I have from them, and their customer service is amazing. Post some pics or better yet make a new thread on your mods. I would love to see how that turned out! Never been a fan of the MFT.